Halloween is the one time a year you can go all out and transform yourself into your favorite superhero. I am sure you’ve seen the superhero costumes at stores, but if you’d rather save some cash check outÂ a few ideas below. 1. Wonder woman- who wouldn’t want to be wonder woman for a day! Be warned, Â this is probably most girls choice when it comes to choosing a superhero costume. All you really need to complete your look is star spangled leggings/shorts/ or a skirt, a red top and the right accessories. 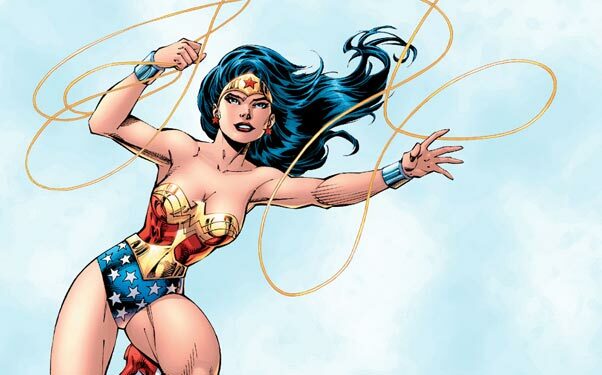 The outfit below screams “Wonder Woman” and you might already own similar pieces. Finish off the look with a winged eyeliner look and some cherry red lips and you are good to go. Black Widow’s costume is pretty easy to recreate, think lots of black and lots of leather. I know the rose and gun sweater isn’t really Black widow-like, but she does carry around a gun! Honestly, I Â just thought the sweater was very cute when I found it online, and it’s a perfect look in case you’d rather wear the weapon instead of carry a prop gun around. Her makeup is pretty minimal, but you can check out the tutorial below inspired by Black Widow’s look. 3. Xena- some might say she’s not a superhero, Â but Xena fights the evil guys and is always looking out for those who need saving. Plus, you get to carry around that cool circle weapon, or Chakram to be more specific. Click here for a super easy tutorial on creating a Chakram with cardboard and some spray paint. You can complete the look by copying one of Xena’s hairstyles,the breaided headband. Check out this super simple tutorial to achieve the hairstyle. You can achieve a cooler Iron Woman look with the right makeup, so check out a couple tutorials below. The first one has a gorgeous eyeshadow tutorial, and the second one is if you are up for a challenge on achieving a very realistic costume. Or, you can browse through these tutorialsÂ to create your own fake gun to use as a prop.